High Definition VideoEye systems set a new standard for CCTV magnification. Over the years, our products have grown in response to customer needs and improved technology. A magnifying glass is a great tool for what it does. But when you sit down in front of an HD VideoEye you will discover how amazing and effective our best VideoEye systems have become. The Vivid Real Life HD900 combines high definition with high power magnification. It delivers a stunning image with five times more pixel density than before. The image is real and true to life, like looking through a window that magnifies. It brings true HIGH DEFINITION clarity and resolution to video magnification. The fully automatic HD300 and HD100 systems are intuitive and easy to use. They focus from any distance and adjust magnification power naturally based on the height of the camera. And they deliver high definition magnification at lower cost. The HD300 features built-in lighting. 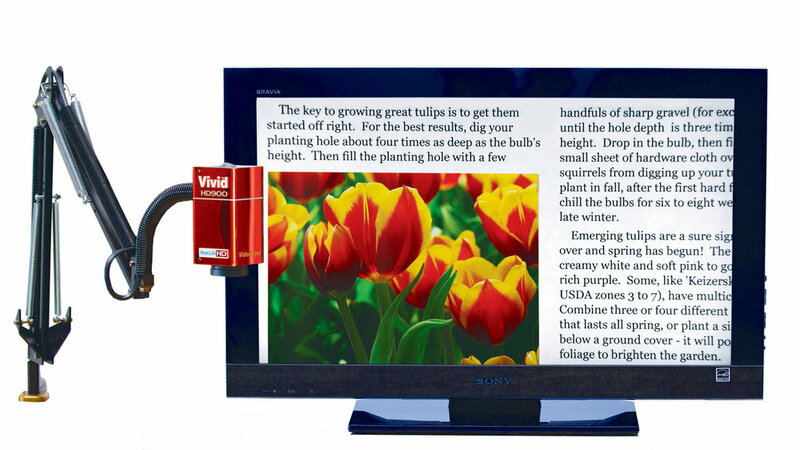 The SideKick lets you enjoy reading while you relax. It provides our flagship HD900 magnifier with a side table ensemble adjusts to fit any recliner.